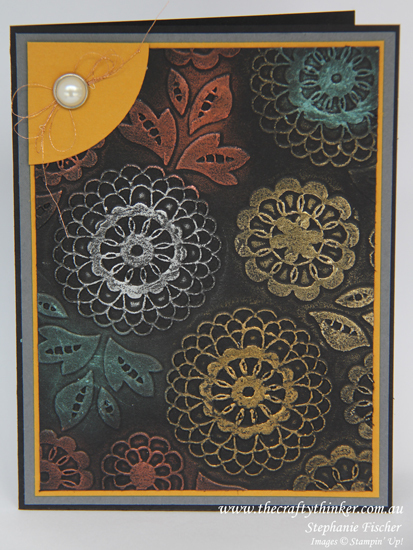 This is a bit of an unusual card for me - I have used some product not carried by Stampin' Up. I've just returned from a month in England. Naturally, I simply had to visit at least one craft store while I was there and some gilding wax jumped into my basket! My test piece was never intended to see the light of day but the more I looked at it, the more I liked the strange mix of colours and random application! I kept the card design simple to let the embossing speak for itself and added some Copper Metallic Thread and a Metal Rimmed Pearl because lace and pearls are a classic mix!